My niece and her husband have just added a baby daughter to their family and I wanted to make a baby card that would resonate with them. I really love the new Berry Burst colour! When my niece's husband first joined the family he rode a motorbike that he loved but he gave it up in order to buy a car suitable for their growing family. So, while a little unorthodox, this card is an acknowledgement of his sacrifice. I also like the sentiment very much. The patterned paper is in the new In-Colour, Berry Burst, from the new Fresh Florals Designer Series Paper Stack. The card is an A5 piece of Berry Burst cardstock folded in half. 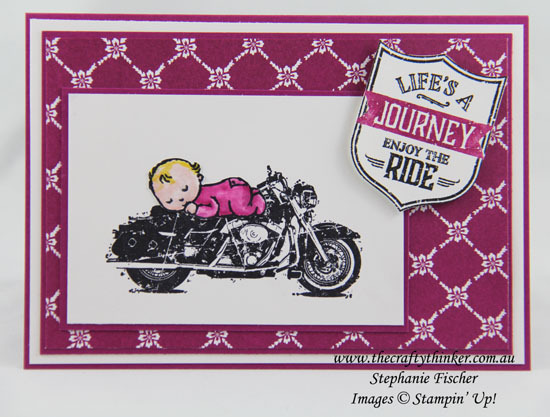 I used a Basic Black and Berry Burst Stampin' Write Marker to ink the sentiment stamp and then fussy cut it.